Why so many clinicians are dissatisfied with images attached to the “Media Tab” on their Electronic Health Records and how we can solve that problem. Do not waste too much of your time making fancy drawings. Perhaps, just a piece of paper with pencil drawing is quite adequate to communicate. Just use our clinical photography app to share the drawing instantly as a radiology series, or with your EHR. Is Text Messaging Really Not Secure? You have heard about HIPAA issues related to Text messaging. In this article, the WinguMD CEO will explain why, how and when of the Text messaging also called SMS. Password stealing is easy to do over WiFI, it is also easy to prevent if you understand how it is done. Comprehensive enterprise solution integrates clinical team collaboration, visible light imaging and EHR for improved pediatric patient outcomes. 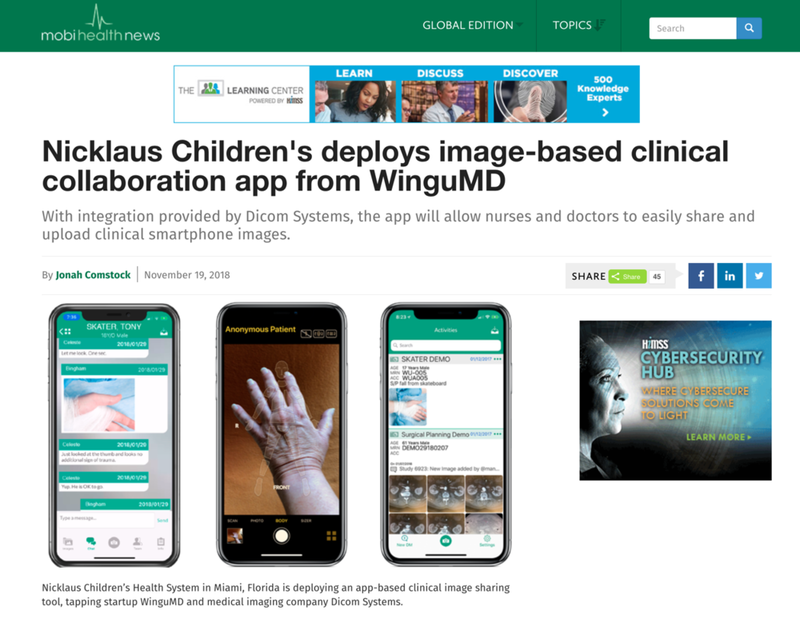 Campbell, CA, November 19, 2018 – Dicom Systems, Inc. (www.dcmsys.com), a leader in Enterprise Imaging IT, and WinguMD, (www.wingumd.com) a clinical collaboration mobile app, have announced a joint deployment for Nicklaus Children’s Hospital in Miami, Florida. Nicklaus Children's is consistently recognized amongst the best children's hospitals in the nation in U.S. News & World Report's “Best Children's Hospitals” edition and no other hospital in Florida has more ranked specialties as listed in the 2018-19 report. As a CHIME #1 “Most Wired” hospital in 2018, Nicklaus has the largest pediatric teaching program in the southeastern U.S. with a track record of leading healthcare IT. In order to better integrate clinical communications over mobile, Nicklaus Children's sought to implement a secure, centralized platform to capture and share clinical photos inside their EHR. WinguMD provided sharing and indexing of serial clinical photos across care teams as well as comparison with pathology, wound care and other imaging. Unifier by Dicom Systems served as the integration engine for workflow and interoperability. “We are on the cusp of a mHealth revolution. Nicklaus Children’s Hospital is an innovative institution that leverages technology to provide better patient care. We are pleased to be the chosen vendor to meet their mobile clinical photo and collaboration needs,” said Dr. Oliver Aalami, practicing vascular surgeon and Co-Founder of WinguMD. Recent research shows growing interest in this emerging solutions category. Frost & Sullivan noted the adoption of visible light imaging modalities across several image-using and image-producing specialties was gaining traction across healthcare organizations. Meanwhile, KLAS Research released a 2018 Enterprise Imaging report that listed adopting and standardizing encounter-based imaging and visible light images as having the greatest impact on workflow success. Dicom Systems (#7900) and WinguMD (#1158G) will be exhibiting in their respective booths during the 104th Radiological Society of North America (RSNA) Annual Meeting from November 25-29, 2018 at McCormick Place in Chicago, CA. Dicom Systems provides Enterprise Imaging solutions that simplify IT and data management. The features-rich Unifier platform delivers intelligent routing, SSL-based DICOM and HL7 integration tools, DICOM Modality Worklist, archiving and de-identification through on-premise, private cloud and leading cloud providers like Google Cloud. Proven at worldwide deployments, Dicom Systems is recognized by top healthcare enterprises, government agencies and partners for next-generation Enterprise Imaging. To learn more, visit www.dcmsys.com. 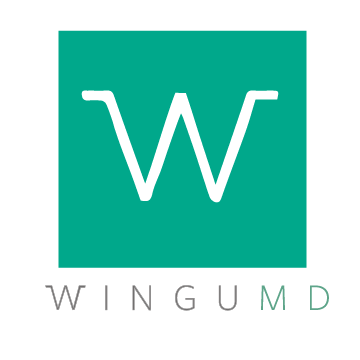 Based in Silicon Valley, WinguMD is an essential mobile clinical collaboration platform that closes information access gaps in the hospital EHR. The comprehensive mobile app unifies individual physicians and physician groups as well as all members of the hospital care team security and efficiency when communicating using personal mobile devices. WinguMD seamlessly integrates all communications, mobile photos, orders and other clinical documents into the EHR and PACS. WinguMD is a Startup Health company. Its BodyMapSnap app is available as a free download from the iTunes App Store. To learn more, visit www.wingumd.com.